Nor Cal Storm 18u & Jesse Bethel H.S. 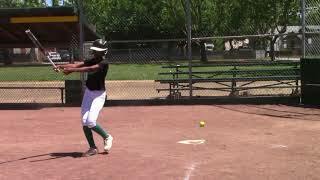 This 2020 grad plays softball at Jesse Bethel H.S., competing in ultra-competitive prep play in Northern California. As a freshman, Teralyn was the starting Shortstop and leadoff hitter on the varsity unit, and also spent time in the circle as a RHP and at 3B. Ahead of her years athletically, Teralyn also led her conference with 29 stolen bases. 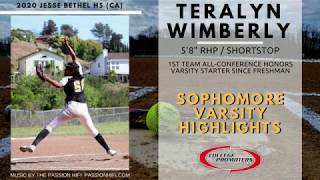 As a sophomore en-route to her 1st Team All-Conference honors, Teralyn was the starting RHP on the varsity unit, was utilized at SS/3B when not pitching, and was once again the leadoff hitter. To no one's surprise, Teralyn eclipsed her number of stolen bases from last season with 34. 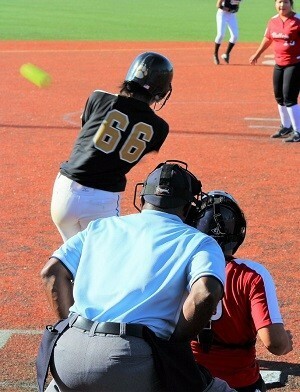 She is the starting SS on the highly regarded Nor Cal Storm 18u squad, and sees time in the circle and at 3B. Teralyn is WITHOUT A DOUBT a young lady to keep a close eye on these next few years in both high school and select play! - Click HERE to read about Teralyn's "Athlete of the Week" award she recieved from the Vallejo Times Herald on 3/18/19 for her 3 Home-Run and 4-inning shutout performance against rival Swett HS.! - Click HERE, HERE, & HERE to read about Teralyn and her standout performances against Fairfield H.S., Vallejo H.S. and Swett H.S.! 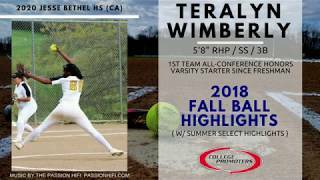 Standing 5'8"-130lbs as a junior, Teralyn combines her 3-pitch arsenal with her ability to dominate at multiple positions to have a BRIGHT future still ahead of herself. Her most recent stats and other pertinent information can be found below! While Teralyn has already proven herself on the softball fields these past few years, she also understands the importance of keeping her grades up to reach her lofty collegiate goals. As a junior, Teralyn is carrying a 3.25 GPA, is a member of WeBe, is taking AP History, and will be taking her SAT/ACT exams later on in her high school career. For more information on Teralyn, contact our San Antonio based staff at (210) 494-6363 anytime! Click HERE to read an article written by the Vallejo Times-Herald on 2/21/19 that sheds some light on Teralyn's dominating performance in the circle against St. Patrick-St.Vincent! 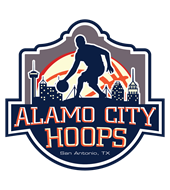 2/11 - vs. Salesain H.S. Please Note: If you've received an email from us regarding Teralyn Wimberly, his or her phone number and email address are provided within that email for your convenience.